Ah! 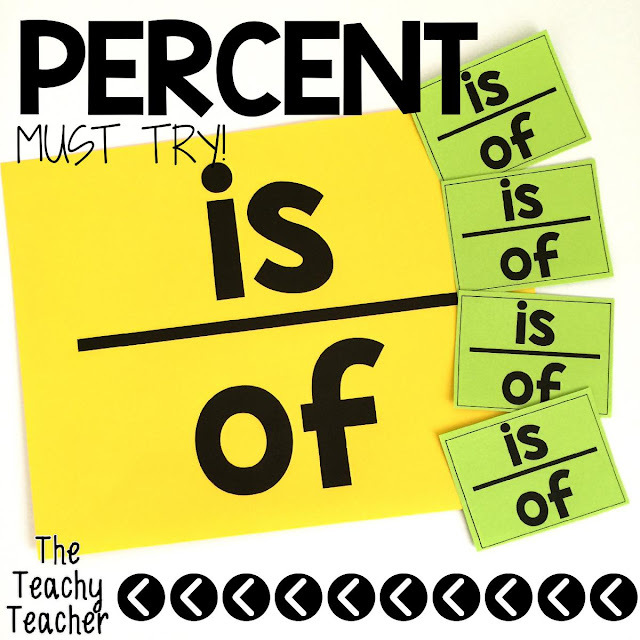 Finding percents! I know this was something that was always hard for me to figure out! So I totally get why we all get confused. This is my sure-fire tip for helping students figure out how to set up proportions. This saves my bacon when setting up proportions and teaching percents. Literally. Bacon. Saved. I've found with how our year is mapped out that keeping things in a "ratio state of mind" helps!!! Let's get the IS OVER OF party started! My students each have an is/of card and we talk about how almost all percent problems have everything mapped out for us. We just have to decipher it...correctly. ha! I have my students circle the "is"...aka the part and box the of...aka the whole. It works like a charm the kiddos totally get how to set it up...no problem! I have these task mats for them to check how they set up proportions before they solve them...you can find them here! Totally give this a try!